The national symbol of the ancient empire of Rome was the eagle. The eagle, the strongest and most aggressive of the birds, dominated the skies. It could fly higher and swoop down faster than any other bird, picking off its prey with little or no resistance. It was a fitting symbol of Roman power. It isn’t well known, but for Rome, the eagle held an even deeper significance than power and superiority. In Rome, the eagle was how the gods would choose who would be king, who would be the next emperor. The eagle chose who would be the “son of god”, as the emperors were often referred. Indeed, the eagle was a very important symbol for the Roman empire. Rome wasn’t the first and wouldn’t be the last to choose the eagle as their symbol of imperial dominance and military might. Before Rome, the eagle was a symbol used by the Egyptian empire, though the Romans made it famous. Even after Rome adopted a watered down version of Christianity and made it the national religion, it retained their eagle symbol. The empire of Rome lasted for around 500 years until it inevitably crumbled under the weight of it’s own destructive power. Throughout the centuries, the eagle would become the symbol of national might for various empires. The Byzantine Empire chose the symbol of an eagle to represent it’s power. The French empire used the symbol during the Napoleonic wars. The Third Reich in Nazi Germany utilized the eagle prominently as a symbol of imperial dominance. Since June 20th 1782, the United States has used its national bird, the bald eagle, on its Great Seal; the choice was intended to at once recall the Roman Empire and be uniquely American (the bald eagle being indigenous to North America). The eagle has been a popular emblem throughout the life of the republic, with an eagle appearing in the flags and seals of the President, Navy, Marine Corps, Air Force, Justice Department, Defense Department, Postal Service, and other organizations. The eagle often symbolizes strength, farsightedness and immortality. It was considered to be the king of the air and the messenger of the highest gods. For the Roman empire, the eagle was more than just a symbol, it was how they chose their emperors. 2,000 years ago things were very different than they are today. Belief in unseen forces was common-place. They didn’t have a 10-day forecast for the weather on a smartphone. The future fate of the weather, events, and kings were believed to be guided by the gods. Mystics, prophets, magicians, and others would use divination, the practice of seeking knowledge of the future or the unknown by supernatural means. During the time of Jesus, Roman emperors were chosen by eagles. Rome chose nearly all its kings by observing the flight of birds, a form of divination known as augury. There were religious officials, named Augurs, who observed natural signs, especially the behavior of birds, and interpreted these as an indication of divine approval or disapproval of a proposed action. Caesar Augustus, at the time of Christ’s birth, to Caesar Tiberius, at the time of Christ’s death, to Caesar Nero, at the time of Paul’s execution: all of them were selected by eagles. The term “augur” is found in our English word inauguration, which refers to the coronation of a king. Roman kings were literally inaugurated. We know that Caesars are not rightful leaders though, only Jesus is king. God was not the one selecting Roman kings with birds. Fascinatingly though, God would end up inaugurating the true king with a bird, but not an eagle. Through his birth, Jesus is appointed God’s King. At his baptism, Jesus is anointed by the Spirit to be God’s King. The phrase “the heavens were opened” means something supernatural is happening. Eternity is breaking into time (Ezekiel 1:1; Revelation 4:1). God’s Spirit or presence descends and comes on Jesus. For Matthew’s first-century readers, the description of the Holy Spirit descending on Jesus “in bodily form” as a dove (Luke 3:22) carries special meaning. It denotes that Jesus is divinely inaugurated as Israel’s new King. 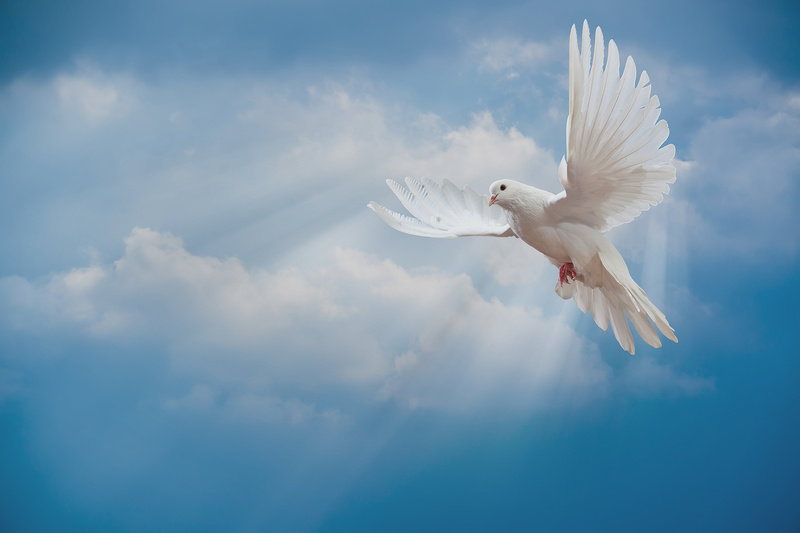 To first-century witnesses, the descent of the Holy Spirit on Jesus “in bodily form” as a dove is a sign that Jesus is God’s choice to be his earthly King, just as the Roman gods send birds to confirm their choice of the Roman emperor. Every warrior’s boot used in battle and every garment rolled in blood will be destined for burning. For to us a child is born, to us a son is given, and the government will be on his shoulders. And he will be called Wonderful Counselor, Mighty God, Everlasting Father, Prince of Peace. Of the greatness of his government and peace there will be no end. Jesus is a different kind of King. He is both King and Servant. To Jewish as well as Roman minds, this duality is an oxymoron. A king doesn’t serve— he is served. Yet this is how God describes his King. Likewise, Jesus himself will declare, “The Son of Man did not come to be served, but to serve, and to give His life a ransom for many” (Mark 10: 45). The descent of the dove upon Jesus gives a clue as to what kind of King he will be. Roman kings ruled harshly with iron fists. They were confirmed to office by the flight of an eagle. The eagle is a fitting symbol for Rome and other empires that would follow it. The dove, on the other hand, is associated with tranquility and peace. Unlike the eagle, which devours others and even destroys its own, the dove nurtures its own and doesn’t harm other living things. The contrast between an eagle and a dove is a shocking revelation that destroyed most people’s preconceptions about what God is like. A similar reversal can be found in the book of Revelation where God is revealed to be not a lion, but a lamb. At his baptism, Jesus is inaugurated by God to be a new kind of ruler. Unlike Caesar, he will be a Servant-King. At Jesus’s birth, God appoints him to be King. At Jesus’s baptism, God anoints him and announces him to be God’s chosen King. All of our natural inclinations tell us that if an eagle and a dove squared off against each other, the eagle would easily win. The promise of scripture is that this is untrue. The way of dominance and violence does not win, it loses in shame. Jesus claims that those who use violence are doomed to die (Matthew 26:52). Christ came to offer a new way, the way of the dove, the way of peace. Jesus showed us that there is no way to peace, through violent means or otherwise; peace is the way. Cicero, De Divinatione, trans. by W.A. Falconer, Loeb Classical Library series, no. 154 (Cambridge: Harvard University Press, 1923).